Grain Carts Operator Visibility Maximized! Brent has been an industry leader in grain handling equipment for more than four decades. The innovative lineup of grain carts and grain wagons help increase efficiency for harvest operations all over the globe. With the ever-changing landscape of farming operations, Brent continues to innovate and develop new products that help meet the demanding needs of a growing population. Whether it's 2,000 bushel grain cart or 550 bushel grain wagon, you can trust Brent to provide the highest quality of equipment. The Avalanche 96-Series can meet the highest demands for capacity and speed with its dual-auger design. The all-welded construction, rubber-cushioned tongue suspension, pivoting vertical auger and multi-directional downspout make the Avalanche the leader in the field. With capacities of 2000, 1500, 1300 and 1100 bushels and unloading speeds up to 1000 bushels per minute, your operation will keep running smoothly during the busy harvest rush. The V-Series lineup brings operator efficiency to new levels with its innovative side-folding corner-auger design. The downspout features 4-way adjustability and is positioned up to 6' ahead of the hitch for enhanced visibility out the side window of the tractor cab. With capacities of 1500, 1300, 1100, 1000, 850 and 750 bushels and unloading speeds up to 650 bushels per minute, you're sure to find the right size grain cart to meet your operation's needs. The 678XL, 678 and 576 models feature capacities of 630 and 550 bushels, making it the right size for smaller acreage requirements. The side-fold, single-auger design allows the upper auger to be longer, increasing side reach and height to easily top off trucks. Model 678XL features an additional 1' of auger side reach and 1' 5" of additional auger height to reach the tallest trucks. Models 678XL, 678 and 576 offer high-capacity grain handling in a mid-size package. 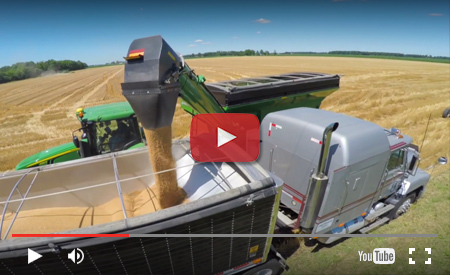 The Grain Train 57- and 57Q-Series can help harvest go smoother with large carrying capacities and an exclusive design that makes operation quick, quiet and convenient. The Grain Train lineup is available in 750, 650 and 550 bushel carrying capacities and feature a rubber suspension, oil-bath hubs, load-equalizing rear torsion axle and full-length, one-piece, center reach tube for multiple unit trailing. The 57-Series features a patented offset door wheel and the 57Q-Series offers an exclusive push-button hydraulic door for ease of use.